A few years ago, I had the pleasure of attending an adult Sunday School class with my late husband Fred and my cousin Phillip Roggow. Phillip is the son of a Lutheran pastor, and he knows his way around a Bible. The class began simply enough, and everyone was having a great time, until the instructor decided to begin attacking the merits of the Star Wars saga. Now, if the instructor had just attacked The Phantom Menace, Attack of the Clones, and Revenge of the Sith, Fred would have probably cheered along. He loved the first Star Wars trilogy but considered many aspects of the prequels grave mistakes. Fred had seen the original Star Wars in theatre over 200 times and could quote the entire film from memory. Indeed, Fred was so inspired by Star Wars it was the reason he devoted his life to film study. 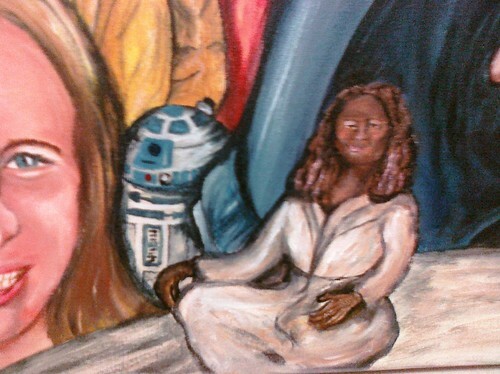 So this teacher was making a very dangerous decision in attacking the classic Star Wars films. And to make matters worse, he told us those films were… evil. The room quickly erupted into two camps: those for and those against Star Wars. We then began a deep discussion about the theological depth of Star Wars in general and about Darth Vader in particular. We focused a great deal of our discussion on the character arc of Darth Vader. The visage of Darth Vader is often used to symbolize great evil within our pop culture. But this ignores the ultimate end of this character’s arc. In the end, Darth Vader reemerges as Anakin Skywalker, destroying the evil emperor and saving his son Luke. Darth Vader dies a good man. He is a redemption story. His arc reminds us that no matter how bad life gets, we can make a choice to do good instead of evil. Recently, as I began working on the format of Social Camp part II, I thought of this long ago discussion. I thought about how pop culture affects our dialog and storytelling. I thought about how things that may seem to have nothing in common, really do. I had been contacting folks about whether they could present speeches on January 21, 2011 at Ignite Speech night at Social Justice Camp. I explained the second weekend of Social Justice Camp would have a focus on health and social justice. I was asking a diverse group of people from various backgrounds to speak. Many were concerned that they knew very little about social justice or very little about health, but I explained that they might not realize it, but they knew more than they realized. To paraphrase Obi-Wan Kenobi, social justice is a lot like the Force: it is around and in us; it affects what we do and binds us together. Not long ago I posted on Twitter an invitation to attend Social Justice Camp. I wrote: "Social Justice Camp II: The Empowered Are Back." I was tweeting a play on words reminding people about Star Wars: The Empire Strikes Back. After thinking about it for a few days, I thought I should create a painting/poster promoting Social Justice Camp. I spoke about this idea with Social Justice camp planners: Kelli Shewmaker, Aaron Ginzoi, and Ben Merrion. We agreed that it would be an interesting visual, and I began contacting participants about including them in the painting. The painting combines elements of several promotional Empire Strikes Back posters from 1980 and 1997. I decided to focus on The Empire Strikes Back, as it is a sequel, just as this year’s event is a sequel of last year’s event. 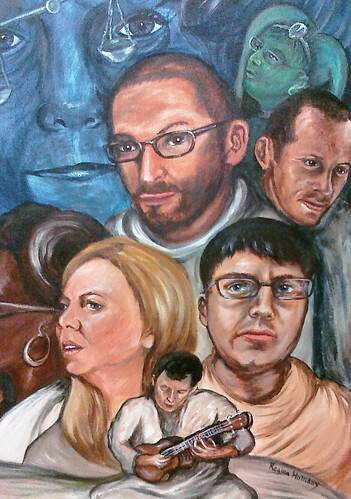 I also focused on Empire because it depicts a challenging time. In Empire, the struggle is long and cold and good does not always triumph. In Empire, you may train for months and not succeed, you may be betrayed by those once considered friends, and you may find yourself frozen and unable to help the ones you love. To paraphrase a description once written by Kelli Shewmaker: Social Justice Camp is a lot like a retreat and renewal for burnt-out activists. The cold of January in DC is not so very different from the chilly atmosphere of the ice planet Hoth. And as we huddle together at MLK Jr. Library or St. Paul’s Lutheran Church, we are slowly creating a very important Rebel Alliance. One of the most powerful things about Social Justice Camp was the network of activists that came together. But the most important thing was the sense of energy and renewal that we attained through meeting with each other. 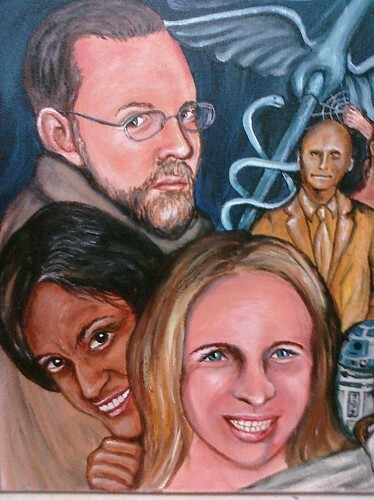 To the far left of the painting we see the faces of Ben Merrion, Chaitra Shenoy and Shannon Lynberg with Holla Back DC. Chai and Shannon seem so happy as they help other women walk confidently down the street. Their social advocacy addresses street harassment, and they have done great work. Ben seems concerned. He is juggling many causes. He is supportive of Hollaback DC, DC Learns, and Social Justice Camp, and he works daily to empower citizens of the District. Beside this trio is Ladd Everitt as C3P0. I have known Ladd for many years as he went to school at American University at the same time as Fred. He currently is the Director of Communication at the Coalition to Stop Gun Violence and will present on January 21. Above Ladd stands Carolyn Capern. Carolyn was one of Fred’s students at AU and will be presenting as well. She is involved in the social justice group in the United Methodist Student Association. Above her stands Joni Podschun who is very active with Save Our Safety Net in DC. She appears to be creating a web or net with hands in the painting. To the right of these figures, sits Ananda Leeke. She sits in a Yoga pose. Or is it a Yoda pose? Smiling, she knows the power of meditation and social networks and her work on Digital Sisterhood combines them both. 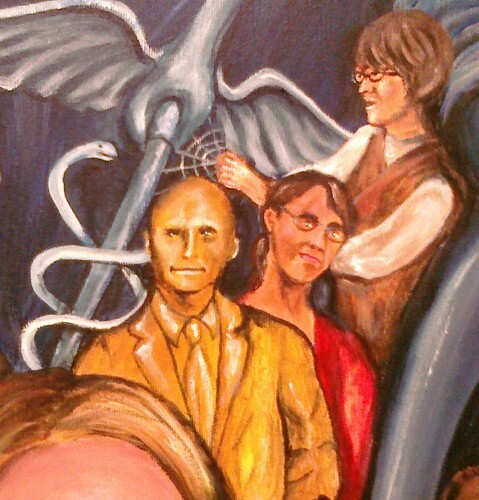 To the far right, Dr. Ted Eytan, a director at Kaiser Permanente, looks out of the frame. He is new to the world of Social Justice but willing to learn and willing to bring his considerable experience in medicine and health information technology to bear. Above Ted is the famous @cyberslate from Twitter, also known as Marie-Michelle Strah. She will be representing Health 2.0 DC and Health IT at Aquilent during the Ignite session. Below Ted is Howard Liebers. When Howard isn’t busy at his day job as Senior Policy Advisor at DCPCA, Howard is helping people with rare diseases connect with needed resources at his non-profit Marble Road. To the left of Howard is Aaron Ginoza. Aaron Ginoza was one of the organizers of last year’s Social Justice Camp and is very interested in the spiritual in relation to justice, so it is quite fitting that he is wearing a Jedi’s robe. Below Aaron is Kelli Shewmaker; she too is instrumental in the planning and execution of Social Justice Camp. She looks to the side quite concerned because Kelli is watching all the details and working toward creating balance in the Force. Below Kelli sits David Hale. David works at NIH and is part of the Pillbox Project. He sits in his Jedi robes strumming a ukulele. This may be a prophesy of things to come, for I have it on good authority that David and his ukulele will be present on the 21. 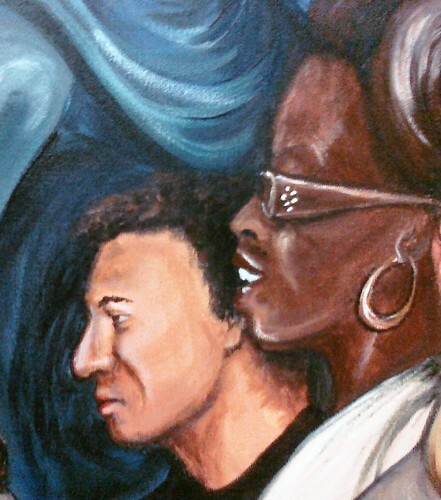 Toward the center of the piece is a profile painting of Alex Priest as he stares into the distance. Alex is finishing up a degree at American University, when he is not busy being a social media guru. Beside Alex is Princess Leia... I mean, Amanda Michelle Jones. Amanda is very active in social media and founded Out of the Boat Ministries. Recently, Amanda was quite ill, and the one piece of good news she had received during her suffering was her inclusion in this painting as such an iconic character. In the middle of this painting are three images painted in blue. To the far left, superimposed over the title, The Empowered Are Back, is the image of a fire. This is the logo of Social Justice Camp. This is the igniting fire, the New Hope. In the center is Lady Justice wielding a caduceus sword and unbalanced scales. On her feet. you see the hint of a running shoe. This is for Girls Gotta Run, an organization that helps Ethiopian girls become runners and thereby have a better life. Ashley Griffith will represent this organization that helps these young girls. The figure of Lady Justice represents our current world where justice often is not just, and health care is not for all. To the far right is Casey Quinlan. She seems to be the sky and space itself. She surrounds the figures in the scene. Do you know Mighty Casey? She wrote Cancer for Christmas. She was diagnosed with breast cancer five days before Christmas in 2007, and her book is the saga of her journey in medicine. And like so many who have been touched by tragedy in healthcare, she works daily to improve communication between practitioners and patients. She is our Return of the Jedi. She is Social Justice. She is the regular person, who after suffering herself devotes her life to helping others. 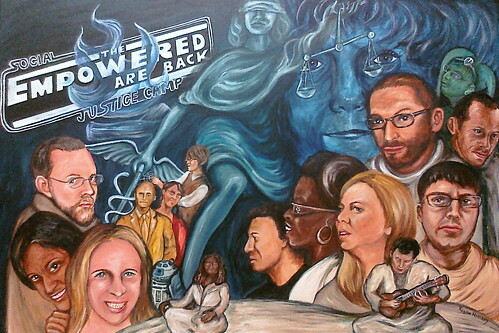 So this is Social Justice Camp: The Empowered Are Back, and I hope you can see it in person at the event. On the evening of the 21st after the ignite speeches, we will auction this piece off to raise funds to give to St. Paul's Lutheran Church for their gracious decision to allow us to use their space to help spread justice for all. I find it very fitting that an argument about Star Wars that started in a Lutheran Church basement shall end in a Lutheran Church basement... and may the Force be with you all. Beautiful. Empowering. Fantastic. Inspiring. Love it!